Having experienced travel by seaplanes in Canada and noticing that the geography, costs and legislation are roughly similar; I consider that seaplane services could be viable in East Anglia and their feasibility as transport infrastructure should be studied further. However it is a chicken and egg situation. My investigation into obtaining grant aid from the Technology Strategy Board for a feasibility study finds that I must be a capitalist with matched funding and have intellectual property to stake on the project. Sadly I have neither. Surely there is a means somehow to fund a study to prove (or disprove) the case for developing local transport infrastructure and amenities without requiring private equity? I set out my case here in the hope that someone can advise me further. Addendum: scroll to the end to see some results of enquiries. Like many other places, in British Columbia seaplanes are unremarkable and everyday transport. Seaplanes provide scheduled services to everywhere there is water with sufficient surface area. Seaplanes can operate safely in busy harbours amidst other traffic such as at Ganges Harbour on Salt Spring Island. All you need to create a seaplane port is a dock and a sock. The runways are provided by nature. Vancouver International Airport is connected to a several docks providing a vast seaplane network serving the west coast of the USA and Canada. King George Dock and London City Airport have even less distance between them. Seaplanes have practically zero impact on water quality. It is less than boats with their poisonous anti-fouling paint and fuel-tainted bilge water. This is how you take seaplanes out of the water for servicing. The most popular craft are the De Havilland Beaver and Twin Otter. Worldwide demand for seaplanes has kept these planes in continuous production for nearly 50 years. Seaplanes serve the urban centres of waterfront cities such as New York, Seattle and Vancouver, where a new city terminal is under construction. A seaplane service operating from the River Thames would reduce the demand on London Heathrow, Gatwick and Stansted and the pressure to expand them. Seaplane trials on the Thames were tried in 1949. Today there is far less river traffic to potentially interfere with each other. A suggestion for a Suffolk route mixing business and tourism markets. For example, golfers could be carried outbound, fresh oysters could come back inbound. Light aircraft are very competitive with other transport modes in cost, carbon emissions and convenience when speed is the passengers' priority. Seaplanes are even more so with their lower infrastructure costs. There is substantial demand for fast and efficient business travel between London and Suffolk. Without it, the region will lose billions in investment and tax revenue to elsewhere. There is a small population under the potential flight path. The noise of aircraft at take-off is less than a tractor. The present transport infrastructure serving Suffolk is at capacity and prone to failure. We can't just keep building more roads to increase their capacity. Building more roads for more efficient transport would negate the carbon emissions saved. Seaplanes should be considered as part of a national transport strategy. Seaplane travel would fit well with established tourism in Suffolk. There are several potential locations in Suffolk for a seaplane port that are suitable, affordable and could generate revenue for local amenity development. One site I would propose is presently derelict and zoned for industrial use. It could become both a seaplane port, training centre and a nature reserve. There would be a need for a national centre for seaplane development somewhere in Britain. This area was used for that in the 1930s. It has good connections to other transport modes serving Europe and Great Britain. Services from here could connect to those from the continent. Local investment is now being made to improve rail capacity and journey times. The £5M Ipswich 'chord' will reduce the rail distance to the north without shunting by 100 miles. Suitable infrastructure is already in place to begin trials. Seaplanes need not be limited to light aircraft operation. Multi-mode transfer between ships, rail and seaplanes used to be the way we travelled. Modern materials and technology could produce even more efficient, quieter and safer aircraft than were built before. The US Navy successfully tested jet-engined flying boats. Seaplanes in Britain are an infant industry ripe for investment and growth. What is holding us back? Report after report points to the UK regulatory conditions framed by agencies unfamiliar with seaplane operations. The FUSETRA program is studying the potential of seaplane transport and the ways to harmonize across Europe the different national aviation rules. Its initial reports concluded that there will be many benefits in developing a European seaplane industry. In 2007 Mott Macdonald transport consultants looked into what are now operational routes in Scotland. 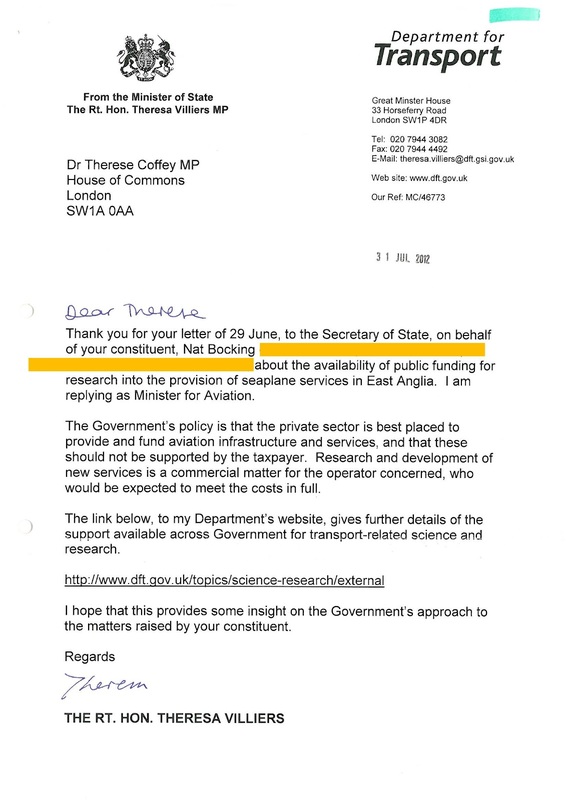 I wrote to Suffolk County Council to suggest they commission a seaplane feasibility study and got this reply by email. ...Unfortunately the field that you describe is not an area within which the Economic and Social Research Council is active. You may wish to approach the Engineering and Physical Sciences Research Council (www.epsrc.ac.uk), who may be able to be of assistance. >I would be grateful if someone could give me any advice on how I can influence the research priorities of the government or the appropriate research councils to consider investment in amphibious aircraft technology and infrastructure in the UK. >EPSRC does indeed support research and PhD Training into advanced engineering which underpins some of the areas you describe in your e-mail. However, EPSRC is not a policy organisation or lobby group in a position to influence government policy in this area directly. Some of the research groups we support may be able to advise on how to raise funding for developing the infrastructure you describe. You can find more information about relevant EPSRC-funded groups on our website www.epsrc.ac.uk (see Grants on the Web option http://gow.epsrc.ac.uk/).